Loomstate !Act Natural! Blog: I left my t-shirt in San Francisco! I left my t-shirt in San Francisco! 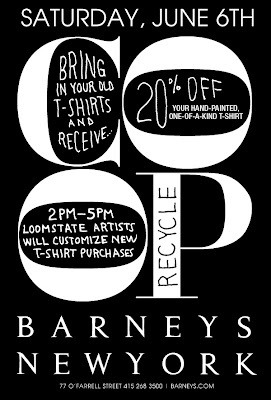 2PM - 5PM LOOMSTATE ARTISTS WILL CUSTOMIZE NEW T-SHIRT PURCHASES! 20% OFF YOUR HAND-PAINTED ONE-OF-A-KIND T-SHIRT!